Pictured: Amy Stuart (strength), Skip Walker-Milne (handstand), with Mia Hughes, Luke Whitefield, and Indra Garvey. Picture credit: Creative Futures Photography. Audience tip: 55 minutes There are only three performances of We Live Here in the 2018 Deathfest program (2nd November, 7pm, with two shows on 3rd November at 3pm and 7pm) Tickets $10. Why not keep an eye on the website and book ahead for future events in the Metro Arts program. The reviewer attended the Friday 2nd November 2018 performance (7:00pm). There are times when I wish I was ten again. Last Friday evening was one of them. As the lights dimmed and the first performer appeared on the stage—casually ‘walking’ along on a rolling oil drum while holding a painters palette, and smiling confidently at the audience—I wished circus school has been an option ‘back in the day.’ For the next 56 minutes the troupe of 11 performers (Jedda Bell, Mia Hughes, Kelsey Booth, Alana Langley, Luke Whitfield, Indra Garvey, Indigo Macrokanis, Tula Homes, Zebedee Davies, Nina O’Brien, and Victoria Mattison) presented a highly-professional and often very polished show that ‘fused’ comedy, tumbling, trapeze, plate-twirling, juggling, and more. And all without safety nets. Pictured: Members of the Fusion Troupe (Jedda Bell, Mia Hughes, Kelsey Booth, Alana Langley, Luke Whitfield, Indra Garvey, Indigo Macrokanis, Tula Homes, Zebedee Davies, Nina O’Brien, and Victoria Mattison). Picture Credit: Geoff Lawrence, Creative Futures Photography. The show was tightly directed to allow each performer to present some of their specialities to an enthusiastic audience. Everyone will have had their own favourites. I was very impressed by the strength work, the chair ‘climbing’ (when reaching for the balloons) was really well done, and the ‘spoonful of sugar’ trapeze work was superb (elegantly demonstrating wonderful control and skill). It was great to see such a range of ages in the group: the older performers demonstrating skills in strength and in major set-pieces (such as the Carmen-style rope work). Some of the younger members of the troupe really shone—for example, when the “puppet” freed herself from the strings to be able to work with hoops while balanced on a ball, and when participating in some of the tumbling and dance. I do hope that Flipside Circus can find the funds for a new speaker system, or get the sound operator to turn the sound down a little (as one of the speakers vibrated and cackled quite alarmingly at various stages, which was a distraction). And if I had to suggest changes, well I might not have included singing or playing the sax in a circus revue, and would have liked to have seen a little more of the comedy ‘fights’ in the first half, as they worked so well when threaded throughout the second half of the show. But these are tiny points. A talented troupe of performers, showing the skills they have learned and entertaining not only proud Mums and Dads but also a broader critical audience. Pictured: A member of the Fusion Troupe (Jedda Bell, Mia Hughes, Kelsey Booth, Alana Langley, Luke Whitfield, Indra Garvey, Indigo Macrokanis, Tula Homes, Zebedee Davies, Nina O’Brien, and Victoria Mattison). Picture Credit: Geoff Lawrence, Creative Futures Photography. I know I’d never have been able to perform at the level demonstrated by the Fusion Performance Troupe. But how lucky are these students to have had the chance. Flipside Circus offer classes during school terms and school holiday workshops and advise that they are “suitable for everybody; ages from 18 months – adults, all skill levels, and all abilities” (http://www.flipsidecircus.org.au/). That particular tent may have gone for me, but having seen ‘Fusion,’ I am sure there are many people who may just have been inspired to give it a go. The reviewer attended the 19th May 2017 (7:30pm) performance. Tickets http://anywheretheatre.com/listings/fusion/ $0-22 (children under 5 free). 60 minutes. The show had only 5 performances during the 2017 Anywhere Festival (12th-20th May). Pictured (Lto R): Circus Clare (Claire Ogden), Boris (Shane Smith), Julio 2 (Lachlan Snow [glasses]) and Dimitri (Simon Arnold [Dad]). Picture Credit: Geoff Lawrence, Creative Futures Photography. In a joyous 45-minute show, the bubbly and slightly-wacky Circus Claire (Claire Ogden) illustrates a journey of self-discovery with hula hoops, juggling, partner acrobatics, aerial tissue, physical comedy, and dance. You’ll come out ‘Walking on Sunshine’ (and not just because of the music selection). The Circus Claire Show is a charismatic performance by a versatile and skilled circus artist. The premise behind the show is deceptively simple. Circus Clare performs an entertaining monologue about a stage career that includes everything from being an ABBA Tribute back-up dancer (at Wavell Services Club no less) through to being one half of an acrobatic duo. At each juncture, the story is illustrated with new skills learned and acts mastered. We listen to the ups and downs of a circus love story, and hear how Circus Clare pursued a range of different acts before realising that her true passion is for the hula hoop. Every member of the 40+ audience had a great view (fantastic facilities at Flipside Circus include comfortable raked seating) and a personal ‘ welcome to my new friends’ from Circus Clare. Younger members of the audience were mesmerised—from the chance to say hello and tell Circus Clare their name, until the opportunity for a photograph with the star at the end of the show. Pictured (Lto R): Circus Clare (Claire Ogden), and Boris (Shane Smith). Picture Credit: Geoff Lawrence, Creative Futures Photography. But even if you feel your own circus days were long-gone, everyone can enjoy the skilled display of hula hooping, acrobatics, aerial tissue and juggling. The music choices kept the mood upbeat (music included ABBA, The Weather Girls, and Katrina and the Waves—courtesy of sound/technical support by Kelsey Adams), and the mixture of solo/duo work, speech and dance provide great variety. The program is a well-judged combination of comedy and skill. I particularly enjoyed the humour of the guest appearances by ‘Boris’ (Shane Smith), ‘Julio 2’ (on the evening I attended, performed by the co-opted Lachlan Snow [glasses]) and ‘Dimitri ‘(on 15th May, courtesy of Simon Arnold [Dad]). The acrobatic/strength ‘pas-de-deux’ with ‘Boris’—in and out of love—were superb. And I hope that Lachlan and Simon get a chance to dine out for many days to come on their hula-hooping and good-natured involvement in the show. Pictured: A juggling Circus Clare (Claire Ogden). Picture Credit: Geoff Lawrence, Creative Futures Photography. Claire Ogden is a skilled performer (performing solo and with Shane Smith as the comedic acrobatic duo Scrambled Legs), and teacher (offering a range of circus classes). The Circus Clare Show premiered as part of the 2015 Wonderland Festival—the year when Circus Clare was selected as a Peoples’ Choice Award winner, following her participation in Brisbane’s Guinness World Record ‘World’s Biggest Busk’. If you get the chance to see her in action in The Circus Clare Show (only one more performance remaining) then go. Verdict: Great Fun—take your Mum, Dad, and friends along. Be warned… you may find you want to run away to the circus too (or at least sign up for the Circus Clare classes). Audience Tip: It’s easy to find. Just look out for the hula hoop students (complete with led hoops and fairy light hats) at the Flipside Circus turning off Mina Parade. The reviewer attended the Sunday 15th 2016 performance. This short run ends on Saturday 21st 2016 (see the Anywhere Festival website for tickets/ details). The production is available for touring, so if you miss it this time keep an eye open for future shows. Pictured (Lto R): Julio 2 (Lachlan Snow), Circus Clare (Claire Ogden), and Dimitri (Simon Arnold). Picture Credit: Geoff Lawrence, Creative Futures Photography. Pictured (L to R): Alison Snook, with The Muses Trio—Christa Powell (violin), Therese Milanovic (piano), and Louise King (cello). Picture Credit: Geoff Lawrence, Creative Futures Photography. The Muses Trio describe their work as ‘celebrating music by women, performed by women.’ It was an inspired idea to launch their debut CD (The Spirit and the Maiden) inside the Boggo Road Gaol as an Anywhere Festival event: celebrating music by female composers, with performances by women (including special guests from Vulcana Women’s Circus) taking place inside the women-only wing of a former prison. Christa Powell (violin, Topology), Louise King (Cello, Cello Dreaming) and Therese Milanovic (piano, Topology), demonstrated their virtuosity in an edgy, compelling, powerful, memorable and often-moving performance. Pictured: Christa Powell. Picture Credit: Geoff Lawrence, Creative Futures Photography. The artists played a selection of the pieces from their new CD, providing insights and information as personal introductions as to the selection of the piece or the life of the composer. Powell spoke touchingly about Amy Beach, introducing Romance with reference to the restrictions placed on Beach’s work(when “imprisoned by time and gender,” and restricted by her husband to holding soirées at home). However, many of the pieces selected by The Muses Trio for the CD are written by their contemporaries. Milanovic talked of the value of direct feedback on recordings, or what she described—when welcoming composer Louise Denson to the launch—as a “dialogue” and a “really lovely process.” Such insights enhanced the experience. For example, Milanovicheld the audience spellbound as she played the charming Song for Comb Man (Kate Neal), having first introduced Neal’s work by encouraging us to look at You Tube video of the TropFest short film which includes the composition. King referred to Nadia Boulanger as “a trailblazer,” before an electric performance of selections from Three pieces for cello and piano. And, having first heard from the composer, in the hands of The Muses Trio Denson’s emotional, lyrical Two Boleros (violin, cello, piano) had us enthralled. Pictured: Alison Snook, Therese Milanovic (piano), Christa Powell (violin), and Louise King (Cello ) with Vulcana Women’s Circus (Performers Bianca Mackail, Rachael Gibson, Abby Kelso and Ellen Grow). Picture Credit: Geoff Lawrence, Creative Futures Photography. The performance was a launch of a CD, but may also have been the beginning of a productive partnership between The Muses Trio and VulcanaWomen’s Circus. Artistic Director Celia White (with Co-Director Michelle Grant) created a mesmerizing performance which opened the second half of the production. Performers Bianca Mackail, Rachael Gibson, Abby Kelso and Ellen Grow, evoked the spirits of Boggo Road inmates as they moved into the space—and impressed with their strength, control and elegance in duets on ‘silks’ (in this case thick nets, which seemed so appropriate for the jail). Pictured: Vulcana Women’s Circus (Performers Bianca Mackail, Rachael Gibson, Abby Kelso and Ellen Grow). Picture Credit: Geoff Lawrence, Creative Futures Photography. The event included an optional addition of a ghost tour. Sadly the Boggo Road Gaol is about to close for a major change: the modern buildings are to be demolished and heritage spaces ‘adapted’. If you want to see a piece of Brisbane’s heritage before it disappears, why not visit the website to book a tour. If you buy a copy of The Spirit and the Maiden CD you can then listen to the music when you visit, and try to imagine the Anywhere Festival experience (links to purchase the CD & digital albums are available via the The Muses Trio website). The performance concluded with a list of acknowledgements and thanks for the many supporters of the work of The Muses Trio. Congratulations to Alison Snook for the attentive page turning—and to Boyds for managing to supply and safely deliver a grand piano into the cellblock. Verdict: Spine-chilling—an inspired launch event. Visit Boggo Road Gaol while you can, and look out for The Spirit and the Maiden CD. The reviewer attended the Saturday 14th 2016 matinee performance. The launch takes place over three performances, 14-15th May 2016 (see the Anywhere Festival website for details). Lara Croydon (Performer—The Orphan), upside down, and Sarah McLeod (Performer—The Stranger), standing, in Learning to Love Gravity at Brisbane’s Powerhouse, 10th May 2015. Picture credit: Geoff Lawrence. One of the many great things about festivals (and festival fringe programs) is that audiences get to see many works at an early stage in the creative process. This is not new in Brisbane. Brisbane Festival has previously had a number of ‘work in progress’ events. For example, I particularly enjoyed Expressions Dance’s First Ritual (an ‘in progress’ show which combined commentary from the choreographer/director with excerpts from the work in 2010, before the production returned to the Judith Wright Centre a year later). Having had the opportunity to see the briefing the year before greatly enhanced my experience of the final production. 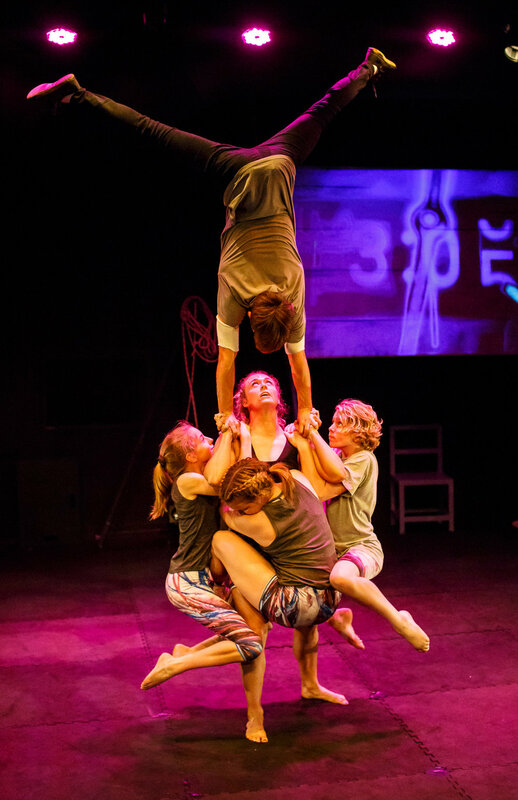 Much in the same way, I am looking forward to seeing future iterations of Learning to Love Gravity, a work in development presented by PlayOn Productions and Vulcana Women’s Circus at the Brisbane Powerhouse Stores Building. Alexander Bayliss (writer) has taken an early idea, suggested by Lara Croydon (Performer-The Orphan), to produce a text that encourages us to reflect on the importance of “the ones that complete us: our friends, our family…our gravity.” The 30 minute work centres on the interactions between the gravity-fearing Orphan and the visitingStranger (Sarah McLeod). The two performers worked really well together, capturing the child-like nature of their characters with some great comic timing. Sarah McLeod (Performer—The Stranger) in Learning to Love Gravity at Brisbane’s Powerhouse, 10th May 2015. Picture credit: Geoff Lawrence. The concept is a simple one: a smooth amalgam of theatre and circus. Being a gravity-loving person myself, I am always impressed by those who can move effortlessly from silk to trapeze, or even spend significant amounts of time suspended upside down from the rafters. To engage in such physical theatre, while acting and speaking at the same time, was even more impressive and enjoyable to watch. Lara Croydon (Performer—The Orphan) in Learning to Love Gravity at Brisbane’s Powerhouse, 10th May 2015. Picture credit: Geoff Lawrence. Until I read the program, available at the venue, I wasn’t aware that Learning to Love Gravity was what the Director’s note referred to as a “first showing” (Steve Pirie, Director). I must admit, I was expecting a little more circus, or physical theatre, and perhaps a little less of the spoken word. But it’s a work in progress, and I realise that this balance may shift as the piece develops and lengthens. I do hope that, as the work progresses, there can be more investment in the lighting (particularly of some of the work ‘in the rafters’). I also felt that the venue didn’t always help with the sound; the performers may need to slow down some of the speeches a little, as the sound can echo around the space. But these are small quibbles, and didn’t affect my overall enjoyment. I saw the show on 10th May, 2015. There are three more opportunities to see this work in progress as part of Brisbane’s Anywhere Festival. It is on again on 22nd, 23rd, and 24th May, 2015. Learning to Love Gravity shows just what is Pozible with crowdfunding support. Congratulations to all the people who ensured it became part of the Anywhere festival. I’d suggest you invest $19: take the opportunity to make your own mind up, and help the team fund the next stage of work on Learning to Love Gravity.